Studied photography at the University of Oregon, School of Fine Arts. Classical «West Coast» tradition of large-format photography + zone system. Strong interest in ethnic-sociological approach. Bonnieux, France. Photographic project in association with the University of Oregon independent study program to document life in a French village; 4 x 5 view camera. 1974: Moves to Paris, France. Studies at the Sorbonne and the American College in Paris, majoring in art history. Moves to New York City. Enrolls in N.Y.U. Film School; works on various professional film productions during this period. Hired as photo researcher at MAGNUM Photo Agency in New York. Photo essay on young boxer Hector Comacho. Returns to Paris with wife and works for MAGNUM, Paris Bureau, as photo researcher. Begins freelancing at this time. 1982: Joins VISIONS Photo Agency. Feature story on «British Butler School» published in GEO. Receives POY (Picture of the Year) award from the University of Missouri for this story. 1983: Begins collaboration with SIPA PRESS. Philippines: following the assassination of Benigno Aquino, the beginning of the «People’s Power» movement that ultimately brings down the Marcos regime. Bhopal, India: Union Carbide industrial catastrophe. 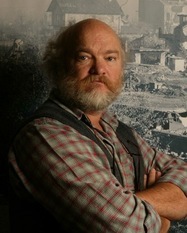 Receives World Press Award – First prize portrait series for this coverage. India: Inter-ethnic violence in following the assassination of Indira Gandhi. India: Rajiv Gandhi in legislative elections for Newsweek. «Snap Elections» in the Philippines and subsequent events that led to the “Edsa Revolt” and the fall of the Marcos regime. Civil war and famine in Southern Sudan; one of the first reporters to meet Sudanese People’s Liberation Army leader John Garang in his southern stronghold; for USN&WR. «Mendiola Massacre» in Manilla, Philippines, one year after Corazon Aquino ascends to power, peasants are shot down during a demonstration in front of the presidential palace. This story was widely published: TIME, Paris Match, Stern. Photo essay on the New People’s Army, the grass roots communist rebellion against the Marcos and the Aquino governments in the Philippines. South Korea: Student demonstrations that ultimately brought down the military regime of Chun Doo-Whan and led to a new era of political democratization. Covers the presidential campaign in South Korea on assignment for U.S. News & World Report. Receives POY award from University of Missouri for this coverage. Stirrings in Eastern Europe: Covers the renewed activity of Lech Walesa and Solidarnosc in Poland. China: Feature on renegade gold mining in Canton. Student demonstrations in Peking that lead to the tragedy of Tian’anmen Square. Poland: First free elections in Poland shot for Time Magazine. Covers major news events in Eastern Europe leading to the end of Soviet communism and the Cold War: Berlin, Prague, Bucharest. Outer Mongolia: feature shot for L’EXPRESS. «Jesuits Around the World»; commemoration of Ignatian Year. The First Gulf War, on assignment for Time Magazine, based in Jordan. Kurdish Refugees on the border between Iraq and Turkey. Begins «Holy Waters», long-term project. Balkan conflict: war between Serbs and Croats in eastern Slavonia. Photo exhibit Visa Pour L’Image. «Holy Waters»: India, Haiti, Israel. Bosnia: beginning of the siege of Sarajevo; first of many trips to cover this story. Oslo Accords – Israel recognizes the PLO. Israel and Gaza shot for TIME and U.S.News & World Report. Arafat’s historic return to Palestine; Gaza and Jericho. Rwanda: Operation Turquoise – French troop withdrawal and Hutu refugees into Zaire. Haiti: Operation “Uphold Democracy” – U.S. military intervention to remove the military regime of Gen. Raoul Cedras and to restore J.B. Aristide back to power. France: Covers French presidential candidate Lionel Jospin. Bosnia: Elections shot for TIME. Eastern Zaire: Mass exodus of Hutu refugees returning to Rwanda. Belgrade: Demonstrations against Milosevic regime. Iran: Presidential elections shot for L’EXPRESS. Covers Lionel Jospin, France’s new prime minister. Photographs various drug-related programs in S.E. Asia for the United Nations Drug Control Program (UNDCP). Mary Robinson, UN High Commissioner for Human Rights, makes inaugural visit to Rwanda. Begins 4 x 5 project to document destruction in Bosnia. Mongolia: first Tsam ceremony since 1937, when prohibited by Communists. Balkans: NATO intervention in Kosovo, for Time Magazine. India: Medha Patkar leads struggle against big dams on the Narmada River. India: Information Technology – Bangalore, Hyderabad, Kerala. Gaza: Return of Arafat after unsuccessful Camp David talks. «Child Victims of Israeli-Palestinian Conflict» for Marie-Claire France. Nigeria: Rev. Reinhard Bonke, Christian evangelical movement for Focus Magazine. Havana, Cuba: Jérôme Savary creates musical comedy «Chano Pozo». Israel: Archaeologist Israel Finkelstein, on site of Megiddo. French presidential elections, covering Lionel Jospin. Arafat «prisoner» in Mukata headquarters surrounded by Tsahal. South Africa: «Dance For All», classical dance for township kids in Capetown, shot for Le Monde II. Ivory Coast: Anti-French troubles; evacuation of French nationals. New York: Demonstrations against U.S. invasion of Iraq. Israel: Archeological sites shot for Sciences & Vie. Baghdad: After the Fall of Saddam Hussein. Israel/Palestine: «The Wall», the separation barrier. Washington D.C.: Jérôme Savary, «La Vie Parisienne», Kennedy Center. «America Mon Amour», report in Oregon before presidential elections. India: Tamil Nadu, aftermath of the Tsunami in South East Asia. Santa Maria, Calif: Michael Jackson trial town. French «NON» to the European Constitution. Bosnia: «Bosnia + 10»; return to this war-ravaged land ten years later. New Orleans, LA: immediate aftermath of Hurricane Katrina. «Darwin vs. Intelligent Design», Dover, PA. for Figaro Magazine. Colombia: Ingrid Betancourt story for Elle Magazine. India: Dominique Lapierre in Calcutta; Elle Magazine. New Orleans, La: Jérôme Savary creates musical comedy «Looking for Josephine». Segolene Royal, presidential candidate for Socialist Party in France. «Social Business», Danone & Grameen Bank partnership in Bangladesh. «The Wall», web documentary on the separation barrier in Israel. Kosovo: After Independence; Figaro Magazine. Annual Report for Danone: Indonesia, Argentina. «Danone Nations Cup», report and multimedia production for Danone. «Shall We Overcome…?», web documentary on the United States before the presidential elections. Annual Report for Danone: Brazil, Japan, Senegal, Russia, Italy. «Danone Nations Cup», report & multimedia production. «Facts on the Ground», web documentary project on East Jerusalem. Annual Report for Danone : China, Argentina, and continued work on a multimedia production for Danone : « Believe in Your Dreams » on their world cup football tournament for 10 to 12 year olds. The « Tea Party » and American conservatism for Figaro Magazine. « Oh My God », a short film on the controversy surrounding a project to build a mosque near ground zero in New York City. Tunisia : beginning of the « Arab Spring ». « Facts On the Ground » – web documentary concerning East Jerusalem. Short documentary : « American Dreamer ». French presidential campagne for Mediapart. Occupy Wall Street movement in the United States. Beginning documentary project « Preacher Man ».